After last year’s exciting debut, I think everyone at TAS was expecting AXPONA Chicago 2014 to be a huge success—and it may well have been financially. (Several record dealers told me that they had never before sold that many LPs and CDs at a trade show—and we sold every single copy of the first volume of The Absolute Sound Illustrated History of the High End that we brought with us to Chicago, and we brought a few.) Sonically, however, AXPONA Chicago 2014 came dangerously close to being a bust, or at least it did in my pearly neck of the high-end woods. Given that much of the gear on display has been shown successfully at many previous shows—including last year in Chicago—the bulk of the blame has to fall on the hotel rooms, which were new to both manufacturers and showgoers. To accommodate the larger number of exhibitors (and projected larger number of attendees) the venue was switched from the smaller Doubletree O’Hare where AXPONA Chicago had its inaugural to the larger Westin O’Hare a mile or so away. While the move may have made commercial sense, it proved (for the most part) to be a sonic disaster. Slap echo and room boom were epidemic in the Westin’s narrow, unusually high-ceilinged rooms. (I can’t tell you how many exhibitors complained about hotel room acoustics.) When you add to this the facts that speakers at and above $15,000 tend to be larger and harder to place in the best circumstances, that they generally produce a good deal of mid-to-low-bass energy, and that they can be powerful enough in the midband and treble on hard transients to set even a well-treated room ringing, parking them in hotel rooms with built-in bass and treble issues was like an engraved invitation to the mishigas that ensued. Nowhere would I say the sound was unqualifiedly great (or as great as it occasionally gets at trade shows), but as is always the case several manufacturers managed to beat the odds and produce very good to excellent results. What’s kind of paradoxical is that several of these AXPONA Chicago 2014 “winners” have been perennial “also-rans” at previous shows—and vice versa. I’m going to start with what was unquestionably the most intriguing product intro at AXPONA Chicago 2014—the $60k Polymer Audio Research MKSX four-way floorstander. 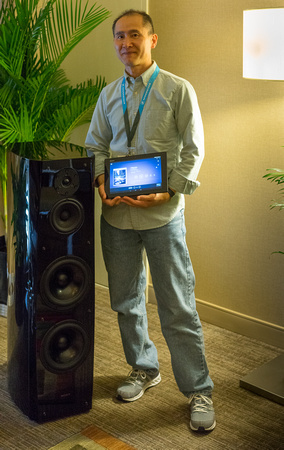 You may have seen exploded-view advertisements in TAS for Polymer Audio Research’s aerodynamically sculpted, metal-alloy-bodied, diamond-driver-equipped loudspeakers, for which grand sonic claims have been made by Polymer’s designer/CEO Daniel Khesin (pictured above with his speaker). It is almost automatic for audiophiles and audio reviewers to dismiss such ad copy as hyperbole (since it usually is), but after listening to the new MKSX repeatedly (I kept coming back for more) I’m not so sure Khesin is gilding the lily—or completely gilding it. Of course, it will take a lot more experience to know for sure, but in Chicago the MKSXs, driven by swank Swiss (say that ten times in a row) FM Acoustics electronics, were unquestionably the most neutral and transparent speakers on display. Here is a multiway that will make transparency-to-sources listeners swoon: ultra-refined, ultra-high-resolution, with very very lifelike timbre, texture, and dynamics on first-rate recordings, and a “disappearing act” (and soundstage) for the ages. From what I’ve gleaned from other sites, previous Polymer Audio speakers have bigger, more pronounced bass than what I heard from the MKSX in Chicago, so I’m not entirely sure that the speaker’s impressively neutral and natural balance, top to bottom, is what you’d typically hear in a home listening room. 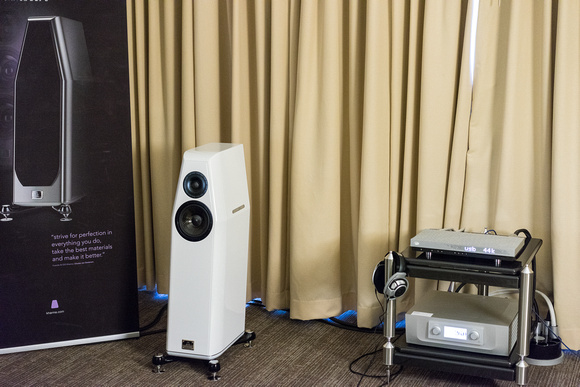 But if the MKSX is as colorlessly neutral as it sounded at the Westin, it may not be the ideal choice for “as you like it” listeners (though, alongside transparency-first listeners, absolute sound ones will love it). In any event this better-than-four-hundred-pound per side, five-driver (diamond tweeter and midrange, dynamic mid/bass, and dual, ported dynamic woofers) hunk of heavy metal will be one of the first things I search out at the next high-end fiesta. 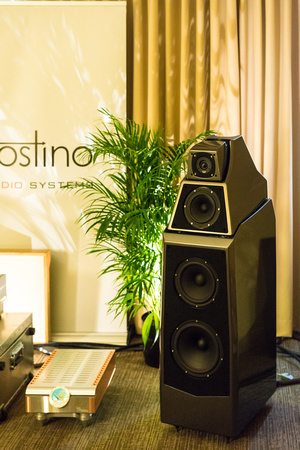 At trade shows Sonus faber and the Audio Research Corporation have been odd bedfellows ever since both companies were acquired by the Italian holding company Fine Sounds. In spite of the fact that the inherently big, dark, voluptuous sound of Sf speakers isn’t particularly well served by the inherently big, dark, voluptuous sound of ARC tubes (too much of the same thing, I’ve thought), the two companies have soldiered on together unimpressively at show after show because that’s the way their joint owner wants it. Well, guess what? 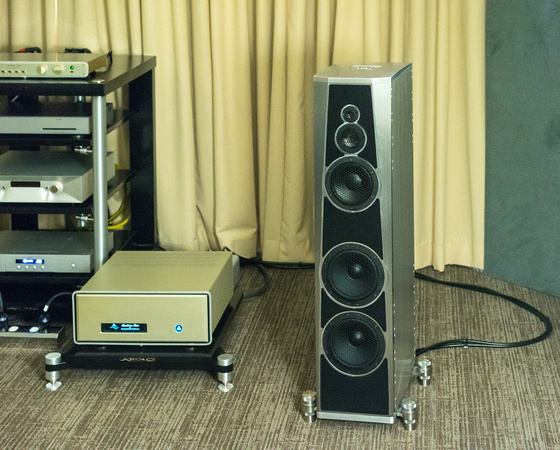 This year—for the first time—ARC and Sonus showed very well together, and not with one of Sf’s little stand-mounts but with its giant, $120k, six-driver, three-and-a-halfway Aida. What changed? In two words, the amplifiers. 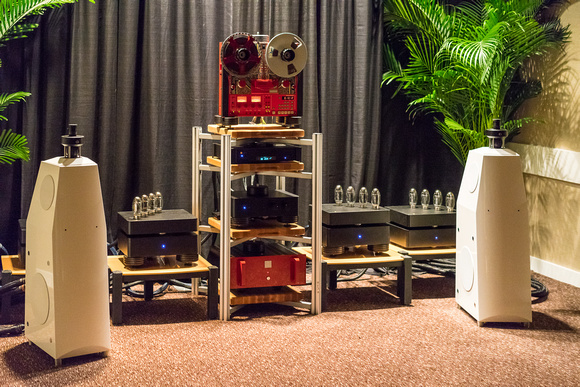 Rather than feeding the Aida tube power, ARC opted to drive them with its DSM450 Class D monoblock amplifiers (two pairs in a bi-amp setup pictured at the start of this blog). Yeah, I know…Class D. But ARC’s switching amps have always sounded different (and better) than other folks’ switchers, dating back to its Class T monoblocks of yesteryear. Moreover, Class D amplification has some things that the Aidas sorely need and that tubes don’t supply as plentifully in the bass, power range, and lower midrange—grip (in the form of a high damping factor), current (around 35 amps), slewing (5V/µs), and power (700W). When coupled with ARC’s tried-and-true Reference 5SE linestage and Reference 2SE phonostage (fed by AMG’s superb Viella 12 turntable/tonearm and a Benz Gullwing cartridge), the Aida demonstrated previously unheard transient excellence, top to bottom. By the end of the show—when I came back to listen to my LPs of Leonard Cohen’s Songs From the Road and Sinatra at the Sands—the Sf Aidas and the ARC electronics were sounding better than this combo has ever sounded. No, the system didn’t have the midrange transient snap and focus of something like the King Sound King III electrostat (see Other Notables below), but it had a good deal more of the weight, color, power, and beauty of the real thing than it has shown in the past, with far better control in the bass. 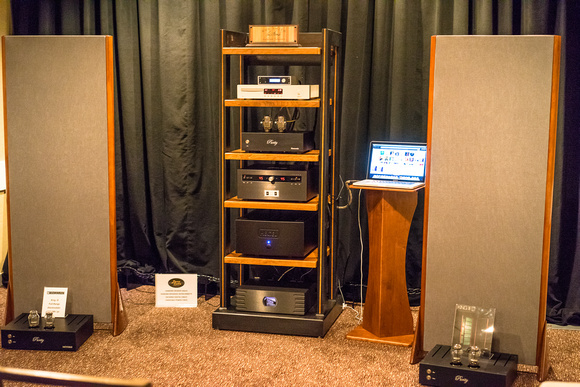 While Wilson Audio’s large (256 pound), $47.5k, four-driver, three-and-a-halfway Alexia floorstander (with “aspherical-propagation-delay” sub-enclosures) has scarcely sounded lousy at previous shows, it has never really won me over the way it did in Chicago. Once again it was the electronics that turned the trick—Dan D’Agostino’s gorgeous new Master Audio Series Momentum preamplifier and Momentum monoblock amplifiers (the Momentum integrated amp was also on display but I didn’t hear it) coupled to the king of digital sources, dCS, and wired with Transparent Audio’s best Reference XL cable. Tone color was gorgeous, resolution extremely high, staging and dynamics outstanding—and this in a lousy room! Since there was no turntable (D’Agostino is promising a Momentum phonostage in the near future), I perforce listened only to digital. But in a show where almost all other digital sources (with a couple of exceptions I will come to) sounded greyed-out in timbre, flat in aspect, and dead in dynamics, this Wilson/D’Agostino/dCS had color, body, power, and life. I should note that Wilson Audio also showed well in the Doshi tube electronics room, where its $30.9k Sasha multiway was paired with Doshi’s Jhor monoblocks and Alaap preamplifier and a Brinkmann turntable. While the sound wasn’t quite as stunning on vinyl as it was via the Technics 15ips reel-to-reel tape deck that was also in the room, it certainly ranked high among the better presentations at this show. All in all, a very good outing for Wilson Audio Specialties. Here again is a loudspeaker that has been highly praised in the audio press, but that hasn’t really won me over when I’ve auditioned it at previous trade shows. And yet in Chicago, powered by Rogue Audio’s Apollo monoblock amplifiers and Hera II preamplifier (both tube units, BTW), and sourced by Sony’s own HAPZ1ES digital server, the $27k, four-driver, three-way Sony SSAR1s were quite extraordinary: warm, sweet, full-bodied on choral music with excellent resolution of individual choristers within an enveloping whole; very robust and lifelike on piano and voice with exceptional solidity and color on piano and extremely delicate detail on singer Jeannette Lindstrom’s lovely voice. Once again I was unable to listen to analog sources in this room, but the quite-affordable Sony HAPZ1ES certainly held up its end of the bargain, sounding anything but greyed-out and dull. 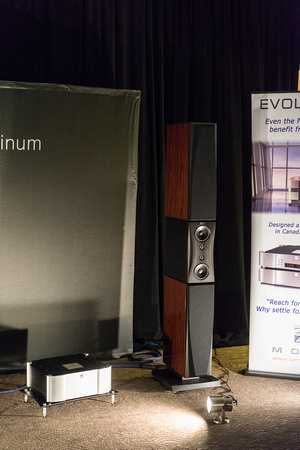 This was the finest Sony presentation I’ve heard, and one of the best sounds at AXPONA Chicago 2014. I know this is becoming monotonous, but as was the case with Sonus faber’s Aida, Wilson’s Alexia, and Sony’s SSAR1, Dynaudio’s big loudspeakers haven’t really wowed me at past shows. I actually visited Dynaudio in Denmark a couple of years ago and saw first-hand its incredibly high-tech facilities (the largest and most sophisticated loudspeaker-manufacturer campus I’ve ever visited), so I know just how much science goes into making its speakers. But…science only takes you so far, IMO. Someone with ears has got to do the voicing, or you end up with something that measures like an electron microscope and sounds just about as musical. Indeed Dynaudios have often seemed to me to be a bit on the analytical side—quick and detailed as hell, but slightly coolish in timbre. Well, just like the other “also-rans” turned “winners” at the Chicago show, Dynaudio’s tall, svelte, eight-driver, three-way $85k flagships, the Evidence Platinums, with their D’Appolito configuration (including twin Esotar tweeters) and gorgeous good looks did an about-face and sounded terrific. Driven by Simaudio’s top-line Moon Evolution Series electronics and sourced by a Clearaudio Innovation turntable, the Platinums were rich, dark, and beautiful on every cut I played, with absolutely superb bass definition and impact even on tricky LPs like Holly Cole’s Temptation. (They were just as good on digital). I don’t know what the moral of these volte-face stories is, but one thing was clear enough. In spite of the double-blind crowd’s claims that everything sounds alike when the lights go off, it is obvious that electronics and sources have to be carefully matched to loudspeakers to get the best out of both. 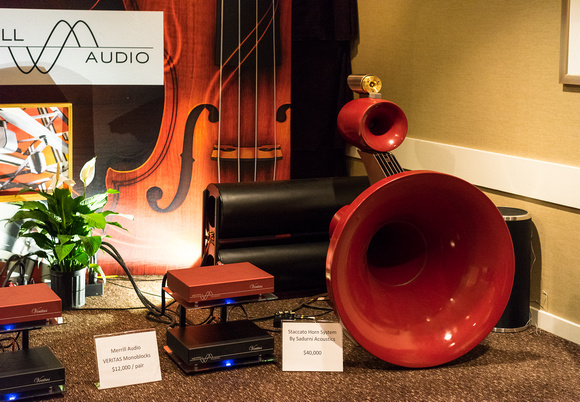 Also good, though not quite as realistic on voice, was the $40k four-way Sadurni Acoustics Staccato horn system, with spherical midrange and mid/bass horns, a compression-driver tweeter, and outboard cylindrical subs. Though the mids were too prominent and aggressive in the smallish room in which the Staccatos were playing, the system’s lifelike presence was undeniable on Jonathan Horwich’s reel-to-reel tapes. The main/sub blend was also outstanding. Acoustic Zen’s $18k, five-driver, three-way, ribbon-tweetered, transmission-line bass Crescendos driven by Triode Japan’s TRX-M845 amps had ’stat-like like detail (though they were also a little dry and bright in the Westin’s very narrow room). Still, their clarity, presence, and neutrality were impressive. Kharma $17.4 S7 two-way—the latest version of the Kharma 3.2 I originally fell in love with decades ago—proved to be as musical as ever: absolutely gorgeous in color with surprisingly good bass, a very full power range and midrange, and sweet treble. Driven by Constellation’s $22.5k Argo integrated amp (with headphone board and a planned phonostage board), the S7, like the King Sound King III, nearly made it into my Top Five Systems—it was that good. Also commendable, though more troubled by room issues, were the mbl 116F (when driven by Jolida's Luxor tube electronics in the United Home Audio room, but not, quite surprisingly, when driven by MBL’s Class D Corona electronics in MBL’s own room), the Lawrence Audio Cello, the Audio Physic Avantera+, the Cabasse Baltic EV, and the Scaena 3.2. Finally, in a show in which sonics were definitely a mixed bag, I want to note a particularly egregious presentation. After haranguing showgoers about “high-definition” audio (which, apparently, doesn’t include anything sourced from analog), AIX’s Mark Waldrep proceeded to turn a near-half-million-dollar German Physik loudspeaker system, the $475k Emperor II, into a laughing stock with one of his high-res multichannel tapes. The sound on female voice was incredibly big, ill focused, bright, and unpleasant. Best Sound (cost no object): Wilson Audio Specialties Alexia driven by D’Agostino Momentum electronics, sourced by dCS digital, and wired by Transparent Audio. Best Sound (for the money): King Sound King III electrostatic loudspeaker (pictured above). Most Significant Product Introduction: Polymer Audio Research MKSX loudspeaker (pictured above). Most Significant Trend: LPs selling like hotcakes on a cold January morning. 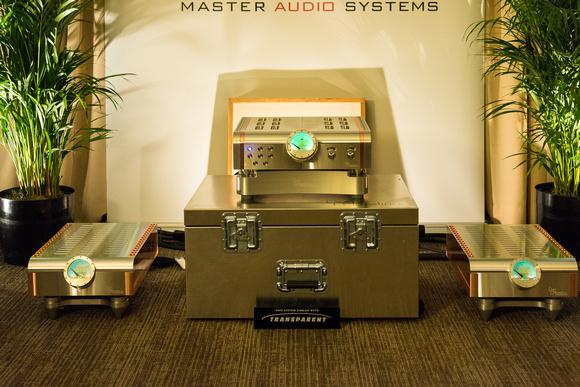 Most Coveted Product: Polymer Audio Research MKSX loudspeaker, D'Agostino Master Audio System Momentum electronics (pictured above). 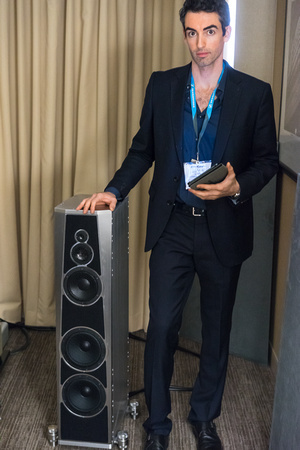 For high-res pictures of all of the loudspeakers (and many of the electronics) I heard at AXPONA Chicago 2014, go to http://jlvalin.zenfolio.com/p822746141.